I’m going to be taking a break from the blog for a week or so. I need to hibernate from the world for a while and get myself together both physically and emotionally; I had a miscarriage on Sunday. I was about 7 weeks pregnant and we were just waiting on the second ultra-sound before we told people. Gorgeous Man called our Ob/gyn at home when it became obvious what was happening. He met us at the hospital and within 2 and 1/2 hours from first signs that the pregnancy was going wrong I was in surgery. I’m told that our chances of having a successful pregnancy next time are good and that we should wait a few months before trying again. Right now though, I’m grieving for this child that didn’t make it. We ate out last night. Gorgeous Man had a faculty meeting and it ran late. I finally got to try the Thai place that we wanted to go to on my birthday. It was gooood!! Gorgeous Man had beef with ginger and noodles and some other stuff (his had a slow burn to it) I had (mild) chicken with cashews, noodles, some vegetables and roasted chilli paste. It had an initial kick, but wasn’t too hot. No photos. I was too hungry to mess ’round with the camera. It’s a little bit on the pricey side, so it won’t become a regular dining experience, but very good for special occasions. 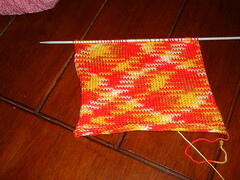 Still working on the red knitting. This project is moving really quickly, more pictures tomorrow. I’m starting to feel a little less fatigued, so who knows the applique may even make an appearance over the next day or two. Probably not tonight though since it is the end of the month and we need to go grocery shopping. One key difference here, from Australia, is that we are now paid at the end of the month instead of fortnightly. It’s taken some getting used to shopping only once a month. but I think we’ve got it down now. We shop for staples monthly and top up on fresh produce (milk, bread, vegetables) as needed. Some more differences between the two nations: Buying fuel for your car. Here, in South Africa the petrol (gas) price is fixed each month and each petrol station in an area will charge the same price (the coast is marginally cheaper than inland). We’ve had a good run lately in that the price has come down for the last three months – it sky rocketed for a while there though. It must be really hard for South Africans who move to countries where petrol stations are all self-service as it would be a very new experience to pump their own petrol. I’ve been enjoying reading your feedback on language variations in the comments from yesterdays post. Keep them coming. There’s been some knitting going on, but quilting is on hiatus until I recover enough energy to turn my mind to learning something new like needle turn applique. Here is a picture of the microfibre yarn from Turkey (made in Turkey and bought here) that I bought. I am loving this yarn. It’s a little bit slippery on the metal needles, but I’m a very tight knitter so this is probably good for me. I love the way the colour is forming a pattern too. I’m not saying what this is going to be. You’re just going to have to wait to find out. Ok, knitting content over. Let’s talk about South Africa. South Africa and Australia are very similar in many ways. For instance: the wide open spaces, the love of sport (not me, but most Australians), the love of the BBQ (or Braai as they say here) and (at least where we are) an outdoor lifestyle. But there are also many differences. Today I’m going to talk about language. Now, I know that there are many words that Australians use that are unique. 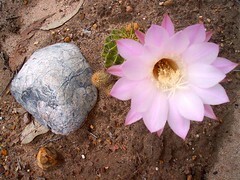 The Calico Cat has talked about this on her blog after her trip to Australia earlier this year. I’m going to confine myself to a few ‘South Africanisms’. 1. Robots – we have robots at street corners and intersections. Also known to the rest of us as traffic lights and street lights. 2. Circles – I would call this a roundabout. 3. Shame – When I first arrived people would often ask me about how we were going finding a house, organising a visa for the cat etc and when I’d tell them they’d pat me on the arm and say “Shame”. For the life of me I couldn’t work out why they were telling me to be embarrassed. Then I learnt that Shame is an expression of sympathy, as in ‘that’s a shame’. I’m not making fun, I’m merely pointing out differences in vocabulary. Being an English teacher (though my true love is history) I find language fascinating. It’s been interesting to see how quickly our own language has changed. We now comfortably speak of cell phones (mobiles) and vacations (holidays) and Braais (bbqs). I’ve even started saying “Shame”, much to Gorgeous Man’s disgust. I’m getting a bit worried about my accent though. When I took the students to The Waterfront last week – a big tourist area. I was asked, in the space of 45 minutes if I was from Canada and what part of the UK I was from. I’m telling myself it’s just because the vendors were unfamiliar with the Aussie accents. 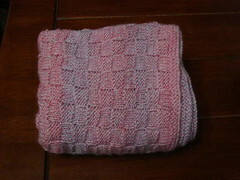 The big news is that I have finally finished the baby blanket that I knitted as a gift for a co-worker. The colours aren’t quite this dull in real life. Now I just need to wash, block and weave in the ends. Speaking of blocking, I have a question: when you knit lace does it need to be blocked each time it’s washed? What about socks? We got the recordings done ahead of schedule on Sunday. It was a lot of fun. I’m really pleased with the song by myself and the song I did with a group(7), but not too pleased with the duet, I just don’t like the song. Anyway, now we need to wait and see what magic they work in the studio. My step-mother-in-law (yes, I have two mother-in-laws) sent us another update of how our cacti collection that we left with them is doing. This was one of my favourites. I started knitting the latest yarn acquisition last night. The microfibre feels lovely and I’m really liking the way that the colours are coming together, I need to knit a little more before taking a picture though. Here is the picture I tried to load yesterday. 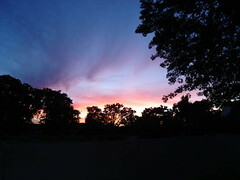 This is taken from my back door. The sky was actually pinker than this, but you get the general idea. This is probably the best sunset we’ve seen so far. Today it feels like someone has stolen all the mountains. They are completely obscured by cloud. Well I’m off to visit some blogs, hope you have a great weekend. Just enough time for a quick post today. I started the final ball of yarn on the dreaded baby blanket last night – note to self, don’t make large projects for co-workers or acquaintences. So it should be finished soon and I can get back to the quilt and finishing the charity sweaters. I had a great picture of last night’s sunset from my kitchen window, but flickr is being very slow, so it’ll have to wait for a later post. I noticed today that I’ve had over 2000 visits since I started blogging. I never expected that so many people would be interested enough to stop by and visit. Thanks to all of you who comment, it’s been great getting to know you. If you are a regular reader, but haven’t commented yet, feel free to make yourself known. It doesn’t matter if you don’t have a blog. Life is pretty hectic here at the moment, and apart from plugging away at the blanket I haven’t had much time to be crafty. I’m feeling a bit frustrated, because I really want to be working on the applique quilt, but am too tired in the evenings to concentrate on learning something new. I went out last night to a 31st birthday party which was nice, very low key, just junk decadent food and a chick flick. Only the girls and kids were invited. Gorgeous Man spent the evening writing exams. So, what to talk about today? Let’s talk about some of my new experiences: Anything to do with labour is very cheap here, as a result nearly every one I know (except me) has a maid or a maid/nanny. One thing we do quite regularly here that we would never did in Australia, is send the laundry out to be done. We usually only do this if the weather over the weekend has been inclement, because I love the feel and smell of sun-dried clothes over those tumble-dried. But the cost of getting a few loads of laundry done is much cheaper here. Hopefully I’ll get some crafting done tonight. 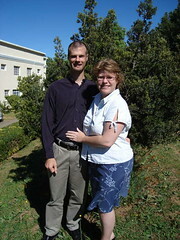 This is the latest picture of the Gorgeous Man and myself.